Definition at line 92 of file XCoreISelLowering.h. Definition at line 72 of file XCoreISelLowering.cpp. References llvm::ISD::ADD, llvm::TargetLoweringBase::addRegisterClass(), llvm::ISD::ADJUST_TRAMPOLINE, llvm::ISD::ATOMIC_FENCE, llvm::ISD::ATOMIC_LOAD, llvm::ISD::ATOMIC_STORE, llvm::ISD::BlockAddress, llvm::ISD::BR_CC, llvm::ISD::BR_JT, llvm::TargetLoweringBase::computeRegisterProperties(), llvm::ISD::ConstantPool, llvm::ISD::CTPOP, llvm::TargetLoweringBase::Custom, llvm::ISD::DYNAMIC_STACKALLOC, llvm::ISD::EH_RETURN, llvm::TargetLoweringBase::Expand, llvm::ISD::EXTLOAD, llvm::ISD::FRAME_TO_ARGS_OFFSET, llvm::XCoreSubtarget::getRegisterInfo(), llvm::ISD::GlobalAddress, llvm::MVT::i1, llvm::MVT::i16, llvm::MVT::i32, llvm::MVT::i64, llvm::MVT::i8, llvm::ISD::INIT_TRAMPOLINE, llvm::MVT::integer_valuetypes(), llvm::ISD::INTRINSIC_VOID, llvm::ISD::INTRINSIC_W_CHAIN, llvm::ISD::INTRINSIC_WO_CHAIN, llvm::TargetLoweringBase::Legal, llvm::ISD::LOAD, llvm::TargetLoweringBase::MaxStoresPerMemcpy, llvm::TargetLoweringBase::MaxStoresPerMemcpyOptSize, llvm::TargetLoweringBase::MaxStoresPerMemmove, llvm::TargetLoweringBase::MaxStoresPerMemmoveOptSize, llvm::TargetLoweringBase::MaxStoresPerMemset, llvm::TargetLoweringBase::MaxStoresPerMemsetOptSize, llvm::ISD::MULHS, llvm::ISD::MULHU, llvm::MVT::Other, llvm::TargetLoweringBase::Promote, llvm::ISD::ROTL, llvm::ISD::ROTR, llvm::ISD::SELECT_CC, llvm::TargetLoweringBase::setBooleanContents(), llvm::TargetLoweringBase::setBooleanVectorContents(), llvm::TargetLoweringBase::setLoadExtAction(), llvm::TargetLoweringBase::setMinFunctionAlignment(), llvm::TargetLoweringBase::setOperationAction(), llvm::TargetLoweringBase::setPrefFunctionAlignment(), llvm::TargetLoweringBase::setSchedulingPreference(), llvm::TargetLoweringBase::setStackPointerRegisterToSaveRestore(), llvm::TargetLoweringBase::setTargetDAGCombine(), llvm::ISD::SEXTLOAD, llvm::ISD::SHL_PARTS, llvm::ISD::SMUL_LOHI, llvm::Sched::Source, llvm::ISD::SRA_PARTS, llvm::ISD::SRL_PARTS, llvm::ISD::STACKRESTORE, llvm::ISD::STACKSAVE, llvm::ISD::STORE, llvm::ISD::SUB, llvm::ISD::TRAP, llvm::ISD::UMUL_LOHI, llvm::ISD::VAARG, llvm::ISD::VACOPY, llvm::ISD::VAEND, llvm::ISD::VASTART, llvm::TargetLoweringBase::ZeroOrOneBooleanContent, and llvm::ISD::ZEXTLOAD. This method should be implemented by targets that mark instructions with the 'usesCustomInserter' flag. These instructions are special in various ways, which require special support to insert. The specified MachineInstr is created but not inserted into any basic blocks, and this method is called to expand it into a sequence of instructions, potentially also creating new basic blocks and control flow. As long as the returned basic block is different (i.e., we created a new one), the custom inserter is free to modify the rest of MBB. Definition at line 1537 of file XCoreISelLowering.cpp. References llvm::ISD::ADD, llvm::MachineInstrBuilder::addReg(), llvm::MachineBasicBlock::addSuccessor(), llvm::TargetLoweringBase::allowsMisalignedMemoryAccesses(), llvm::ISD::AND, assert(), llvm::MachineBasicBlock::begin(), llvm::ISD::BUILD_PAIR, llvm::BuildMI(), llvm::TargetLowering::DAGCombinerInfo::CommitTargetLoweringOpt(), llvm::SelectionDAG::computeKnownBits(), llvm::MachineFunction::CreateMachineBasicBlock(), llvm::TargetLowering::DAGCombinerInfo::DAG, llvm::Depth, llvm::dyn_cast(), llvm::MachineBasicBlock::end(), llvm::MachineInstr::eraseFromParent(), llvm::ISD::EXTRACT_ELEMENT, F(), llvm::MCInstrInfo::get(), llvm::DataLayout::getABITypeAlignment(), llvm::MemSDNode::getAddressSpace(), llvm::MemSDNode::getAlignment(), llvm::StoreSDNode::getBasePtr(), llvm::MachineBasicBlock::getBasicBlock(), llvm::KnownBits::getBitWidth(), llvm::MemSDNode::getChain(), llvm::SelectionDAG::getConstant(), llvm::SelectionDAG::getContext(), llvm::SelectionDAG::getDataLayout(), llvm::MachineInstr::getDebugLoc(), llvm::APInt::getHighBitsSet(), llvm::ilist_node_impl< OptionsT >::getIterator(), llvm::APInt::getLowBitsSet(), llvm::SelectionDAG::getMemmove(), llvm::MemSDNode::getMemoryVT(), llvm::SelectionDAG::getMergeValues(), llvm::SDValue::getNode(), llvm::SelectionDAG::getNode(), llvm::SDValue::getOpcode(), llvm::MachineInstr::getOpcode(), llvm::SDNode::getOpcode(), llvm::SDValue::getOperand(), llvm::MachineInstr::getOperand(), llvm::SDNode::getOperand(), llvm::MachineBasicBlock::getParent(), llvm::MemSDNode::getPointerInfo(), llvm::MachineOperand::getReg(), llvm::SDValue::getResNo(), llvm::EVT::getStoreSizeInBits(), llvm::SelectionDAG::getTargetLoweringInfo(), llvm::EVT::getTypeForEVT(), llvm::StoreSDNode::getValue(), llvm::SDValue::getValueSizeInBits(), llvm::SDValue::getValueType(), llvm::SDNode::getValueType(), llvm::SelectionDAG::getVTList(), llvm::ConstantSDNode::getZExtValue(), llvm::SDNode::hasNUsesOfValue(), llvm::SDValue::hasOneUse(), llvm::MipsISD::Hi, llvm::MVT::i32, llvm::MVT::i64, llvm::MachineFunction::insert(), llvm::ISD::INTRINSIC_VOID, llvm::ISD::INTRINSIC_W_CHAIN, isADDADDMUL(), llvm::TargetLowering::DAGCombinerInfo::isBeforeLegalize(), llvm::TargetLowering::DAGCombinerInfo::isBeforeLegalizeOps(), llvm::LSBaseSDNode::isIndexed(), llvm::TargetLowering::isInTailCallPosition(), llvm::ConstantSDNode::isNullValue(), llvm::MemSDNode::isVolatile(), llvm::XCoreISD::LADD, llvm::ARM_MB::LD, llvm::XCoreISD::LMUL, llvm::MipsISD::Lo, llvm::XCoreISD::LSUB, llvm::BitmaskEnumDetail::Mask(), llvm::SelectionDAG::MaskedValueIsZero(), N, llvm::SDValue::reachesChainWithoutSideEffects(), llvm::KnownBits::resetAll(), llvm::ISD::SELECT_CC, llvm::MachineBasicBlock::splice(), llvm::ARM_MB::ST, llvm::ISD::STORE, llvm::ISD::SUB, TII, llvm::MachineBasicBlock::transferSuccessorsAndUpdatePHIs(), and llvm::KnownBits::Zero. If a physical register, this returns the register that receives the exception address on entry to an EH pad. Definition at line 131 of file XCoreISelLowering.h. If a physical register, this returns the register that receives the exception typeid on entry to a landing pad. Definition at line 138 of file XCoreISelLowering.h. References Callee, Context, llvm::Depth, I, llvm::MipsISD::Ins, LowerADJUST_TRAMPOLINE(), LowerATOMIC_FENCE(), LowerATOMIC_STORE(), LowerFRAMEADDR(), LowerLOAD(), LowerRETURNADDR(), LowerSTORE(), LowerVAARG(), LowerVASTART(), llvm::SystemZISD::TM, and TRI. Return the entry encoding for a jump table in the current function. The returned value is a member of the MachineJumpTableInfo::JTEntryKind enum. Definition at line 338 of file XCoreISelLowering.cpp. References llvm::ISD::ADD, llvm::alignTo(), assert(), llvm::XCoreISD::BR_JT, llvm::XCoreISD::BR_JT32, llvm::MachineJumpTableInfo::EK_Inline, llvm::SelectionDAG::getConstant(), llvm::SelectionDAG::getDataLayout(), llvm::SelectionDAG::getGlobalAddress(), llvm::JumpTableSDNode::getIndex(), llvm::MachineFunction::getJumpTableInfo(), llvm::MachineJumpTableInfo::getJumpTables(), llvm::SelectionDAG::getLoad(), llvm::SelectionDAG::getMachineFunction(), llvm::SelectionDAG::getMergeValues(), llvm::SDValue::getNode(), llvm::SelectionDAG::getNode(), llvm::SDValue::getOperand(), llvm::TargetLoweringBase::getPointerTy(), llvm::SelectionDAG::getTargetJumpTable(), llvm::SDValue::getValue(), llvm::SDValue::getValueType(), High, llvm::MVT::i32, llvm::HexagonISD::JT, llvm::ISD::OR, llvm::MVT::Other, llvm::ISD::SHL, llvm::ISD::SRL, and llvm::ISD::TokenFactor. EVT is not used in-tree, but is used by out-of-tree target. Definition at line 103 of file XCoreISelLowering.h. References I, llvm::MVT::i32, MI, N, and Results. Definition at line 45 of file XCoreISelLowering.cpp. References llvm::XCoreISD::BL, llvm::XCoreISD::BR_JT, llvm::XCoreISD::BR_JT32, llvm::XCoreISD::CPRelativeWrapper, llvm::XCoreISD::CRC8, llvm::XCoreISD::DPRelativeWrapper, llvm::XCoreISD::EH_RETURN, llvm::XCoreISD::FIRST_NUMBER, llvm::XCoreISD::FRAME_TO_ARGS_OFFSET, llvm::XCoreISD::LADD, llvm::XCoreISD::LDWSP, llvm::XCoreISD::LMUL, llvm::XCoreISD::LSUB, llvm::XCoreISD::MACCS, llvm::XCoreISD::MACCU, llvm::XCoreISD::MEMBARRIER, llvm::XCoreISD::PCRelativeWrapper, llvm::XCoreISD::RETSP, and llvm::XCoreISD::STWSP. isLegalAddressingMode - Return true if the addressing mode represented by AM is legal for this target, for a load/store of the specified type. Definition at line 1902 of file XCoreISelLowering.cpp. 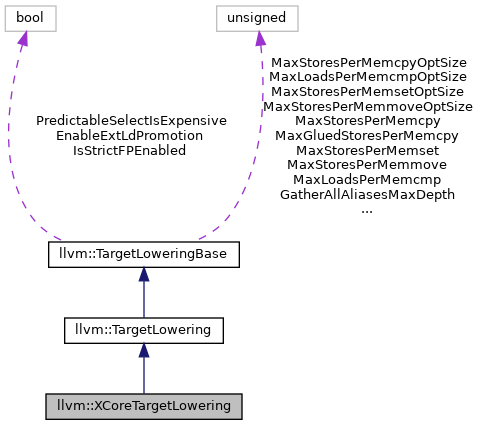 References llvm::TargetLoweringBase::AddrMode::BaseGV, llvm::TargetLoweringBase::AddrMode::BaseOffs, llvm::TargetLowering::getRegForInlineAsmConstraint(), llvm::DataLayout::getTypeAllocSize(), llvm::Type::getTypeID(), llvm::TargetLoweringBase::AddrMode::HasBaseReg, isImmUs(), isImmUs2(), isImmUs4(), llvm::TargetLoweringBase::AddrMode::Scale, Size, llvm::StringRef::size(), TRI, and llvm::Type::VoidTyID. Return true if zero-extending the specific node Val to type VT2 is free (either because it's implicitly zero-extended such as ARM ldrb / ldrh or because it's folded such as X86 zero-extending loads). Definition at line 178 of file XCoreISelLowering.cpp. References llvm::SDValue::getOpcode(), llvm::EVT::getSimpleVT(), llvm::SDValue::getValueType(), llvm::MVT::i8, llvm::EVT::isInteger(), llvm::EVT::isSimple(), llvm::ISD::LOAD, LowerOperation(), and llvm::MVT::SimpleTy. LowerOperation - Provide custom lowering hooks for some operations. Definition at line 197 of file XCoreISelLowering.cpp. References llvm::ISD::ADD, llvm::ISD::ADJUST_TRAMPOLINE, llvm::ISD::ATOMIC_FENCE, llvm::ISD::ATOMIC_LOAD, llvm::ISD::ATOMIC_STORE, llvm::ISD::BlockAddress, llvm::ISD::BR_JT, llvm::ISD::ConstantPool, llvm::ISD::EH_RETURN, llvm::ISD::FRAME_TO_ARGS_OFFSET, llvm::ISD::FRAMEADDR, llvm::SDValue::getNode(), llvm::SDValue::getOpcode(), llvm::ISD::GlobalAddress, llvm::ISD::INIT_TRAMPOLINE, llvm::ISD::INTRINSIC_WO_CHAIN, llvm_unreachable, llvm::ISD::LOAD, llvm::ISD::RETURNADDR, llvm::ISD::SMUL_LOHI, llvm::ISD::STORE, llvm::ISD::SUB, llvm::ISD::UMUL_LOHI, llvm::ISD::VAARG, and llvm::ISD::VASTART. ReplaceNodeResults - Replace the results of node with an illegal result type with new values built out of custom code. Definition at line 230 of file XCoreISelLowering.cpp. References llvm::ISD::ADD, llvm::XCoreISD::CPRelativeWrapper, llvm::XCoreISD::DPRelativeWrapper, llvm::dyn_cast(), llvm::SelectionDAG::getNode(), llvm::SDNode::getOpcode(), llvm::GlobalValue::getSection(), llvm::GlobalValue::getValueType(), llvm::GlobalValue::hasLocalLinkage(), llvm::GlobalValue::hasSection(), llvm::MVT::i32, llvm::Type::isFunctionTy(), llvm_unreachable, llvm::XCoreISD::PCRelativeWrapper, llvm::SmallVectorTemplateBase< T >::push_back(), llvm::StringRef::startswith(), and llvm::ISD::SUB.